Wrestling may not be the first thing that comes to mind when you think about inspirations for a Mexican restaurant in Old Town Alexandria. But the theme, referred to as Lucha Libre in Mexico, fits well at the new Urbano 116. 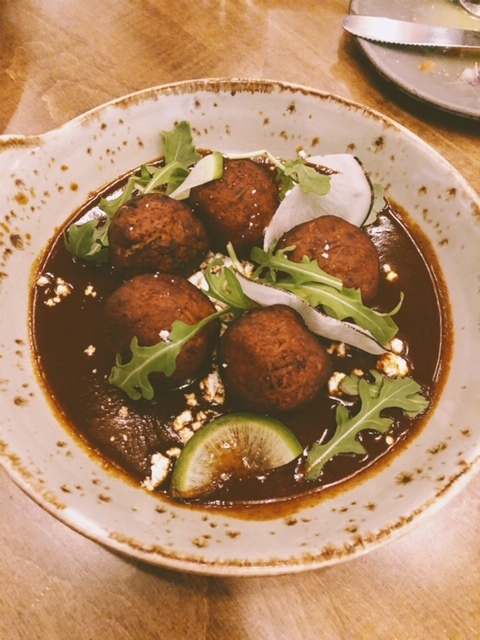 The restaurant is edgy and raucous, and you’ll probably find yourself fighting over the last drops of mole to spoon onto a chip or dress up a taco or enchilada. 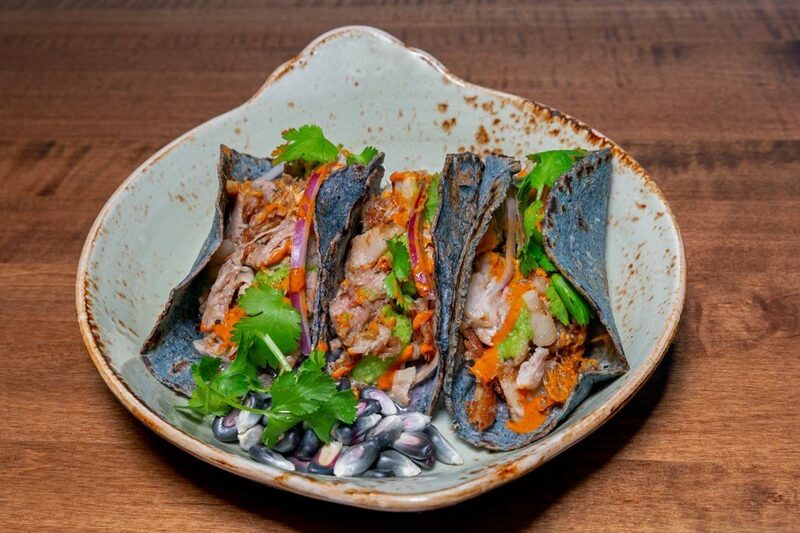 On the menu at Urbano 116 is a line-up of Mexican and Oaxacan dishes that intertwine authenticity with creativity. Sauces and salsas offer varying degrees of punch. While none hit me as being excessively spicy, they are a step up in complexity from your average Mexican restaurant. Florian takes his tortillas seriously. Corn tortillas are made inhouse from heirloom Oaxacan corn. They are enhanced by nixtamalization, a 48-hour process in which corn is soaked in limewater, washed, and hulled. The process makes the corn easier to grind, adds nutritional value, and improves flavor and aroma. You’ll want to wrap as much as you can in these pliable blankets. A meal here should kick off with ceviche. 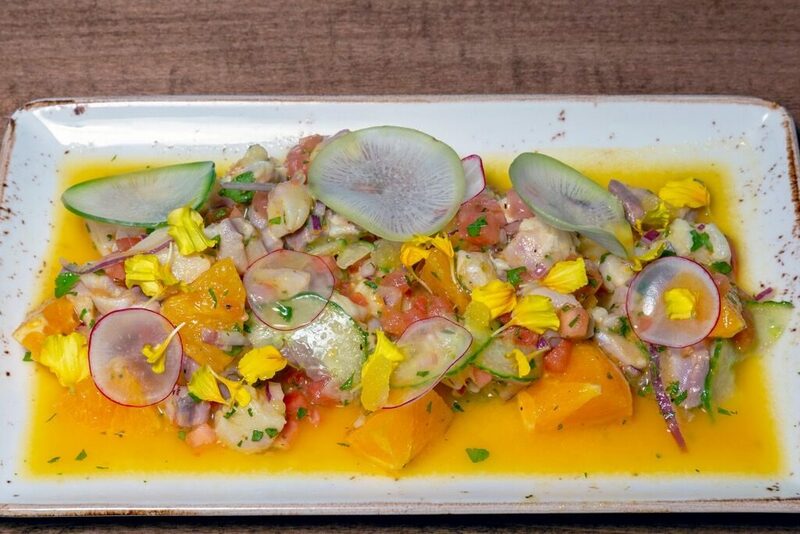 Ceviche Amarillo is bold and brash with rockfish, ginger, orange, lime, pepper and pico de gallo. Shrimp ceviche pairs avocado, tomatoes, cucumber, pico de gallo, and a hit of chile de Arbol. My favorite bite comes early in the meal with plaintain molotes. The orb of fried pastry dough is filled with a mixture of goat cheese and plantains swimming in a pool of black mole. Slightly sweet, savory, and spicy – I’m a big fan. Grilled tlayuda is another competitor for my attention. 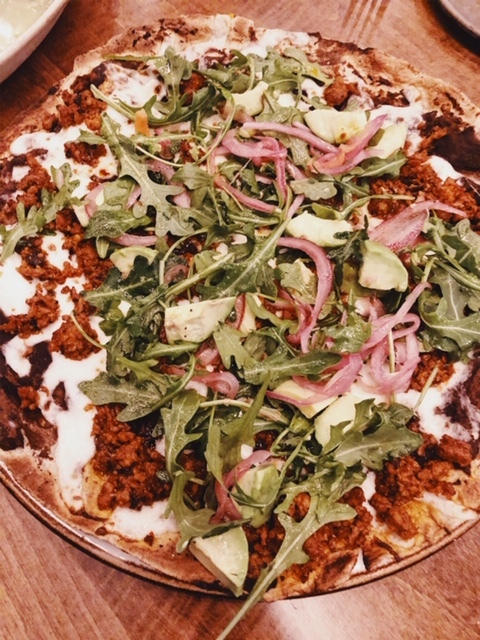 It looks like flatbread, but is actually a crispy fried tortilla slathered with a snappy blend of heirloom black beans, Oaxacan cheese, avocado and chorizo. Tacos fill out a good portion of the Urbano 116 menu. At $7-$10 they are made for mixing and matching, as the chef plays with various ingredient combinations. There is a feisty taco with fried rockfish, pico, chile aioli, green sauce and arbol sauce. Beef tongue with avocado tomatillo sauce is also a good way to go. And cashew mole plus a nutty salsa macha sauce lift up cauliflower tacos. Entrees give moles a chance to shine. Fruit mole is a perfect match for pork belly with sweet potato puree, grilled pineapple, and plantains. Black mole kicks up grilled Cornish hen with black bean tamal and plantains. Braised short rib is dressed up with almond mole and cauliflower puree. 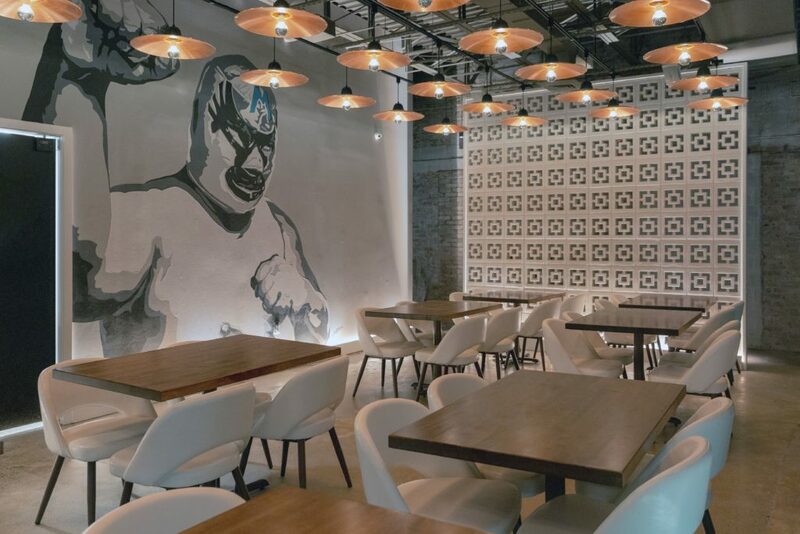 The décor gives off a cool Mexico City vibe that integrates the wrestling theme. There are white-washed brick walls, concrete floors, and contemporary metal light fixtures. 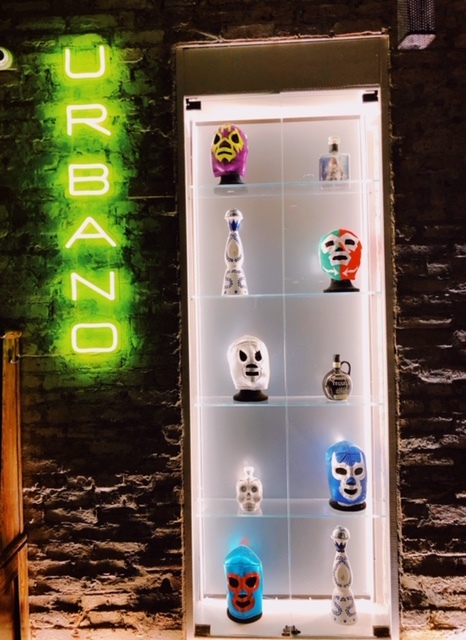 A neon green sign with the word Urbano brightens a display case featuring masks that lucha libre wrestlers wear as a part of their persona along with tequila bottles. The back wall of the restaurant features a mural by David Amoroso depicting the pioneer of lucha libre, Mil Máscaras. He’s known as the “Man of 1,000 Masks.” Slightly intimidated by the image, I feel compelled to eat everything on my plate or suffer the consequences. The cocktail menu entices with Mexican flavors infused into drinks like Mezcamule with muddled cucumber and candied ginger and Urbano Punch with jalapeno, agave syrup and grapefruit. Dessert may promote a fight to the finish. There’s flan with plantain puree and berries, banana mezcal tart with cashew crumble, Mexican chocolate tamal with mixed berry sauce, and fresh churros. Seeking a to-go option? Tacos are available from a takeout window during the day with churros offered at night. 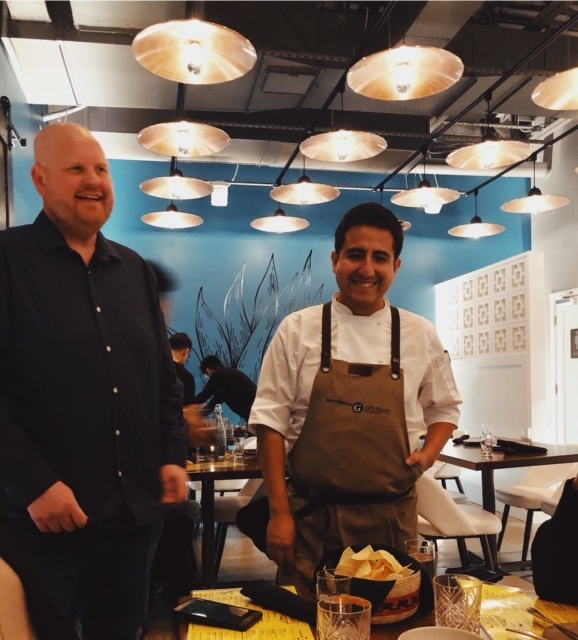 Urbano 116 brings a welcome taste of Mexico City to Northern Virginia. If you wrestle over where to catch your next taco, enchilada, or churro look no further than 116 King Street.